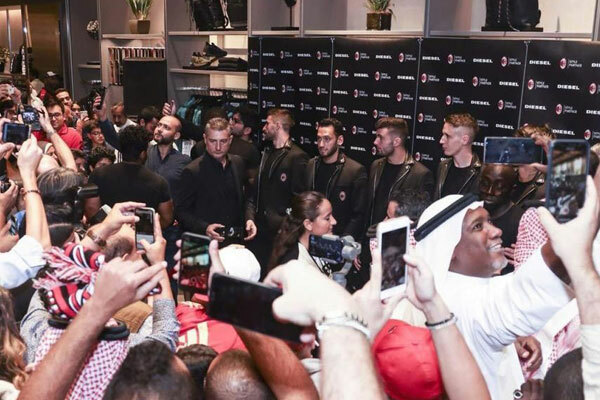 Italian denim brand Diesel hosted a special meet-and-greet for fans of AC milan stars Calhanoglu, Conti, Cutrone, Paqueta’, Borini and AC Milan legend Daniele Massaro at its store in Jeddah, Saudi Arabia. The event included meeting with various Saudi media publications, an autograph signing, meet-and-greet, and various opportunities for fans to interact and take photos with the players. The team is currently in Saudi Arabia to play the Italian Super Cup against Juventus. “We are very excited to be here in Saudi Arabia and thanks to the overwhelming support we’ve received here in Jeddah by our fans. It’s always an amazing experience to meet fans away from our home country and see such strong support for AC Milan in Saudi Arabia too. Thanks to Diesel and their local partner Beside for giving us the chance to meet local fans and hear their well wishes,” Massaro said.